Finnbar’s Force is very pleased to announce further funding for a research project aimed at improving diagnosis and treatment of childhood brain tumours. 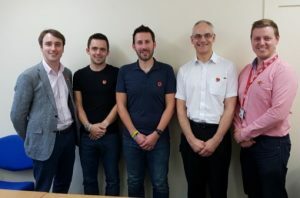 Last month members of our Strategy and Direction team visited Birmingham Children’s Hospital to meet Professor Andrew Peet and his researchers who are carrying out the project, developing a new MRI scanning technique that can differentiate chemicals present in tumours. The researchers have found that different types of tumour have different chemicals present in varying amounts, some of which can be detected by the special MRI technique. which could therefore potentially be used to identify the tumour. They are currently working on building and refining a database of the MRI signatures of chemicals found in tumours by comparing them to biopsy samples of the same tumours. The project should ultimately increase the speed and accuracy of diagnosis and therefore treatment, which would be particularly useful in high-grade tumours that require more urgent and aggressive treatment. It is hoped that it could be used effectively in cases where a biopsy is too dangerous to obtain and may also be able to replace traditional biopsy altogether one day. Our team received a tour of the facilities and a presentation on the science and method behind the technique by Prof. Peet, followed by questions and answers with the Professor and his lead researcher Chris. The visit was truly fascinating and we are extremely excited to support the project. 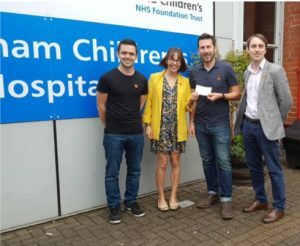 On the day we also met Katie Heywood of Action Medical Research for Children, who are co-funders of the project, presenting her with our initial grant of £1000. 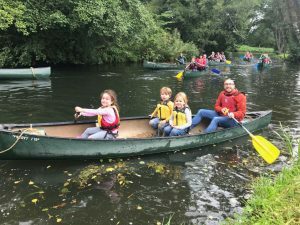 On Thursday 12th October, Finnbar’s parents, Claire and Tristan, will travel to a special event in London to present a further cheque to Action’s celebrity ambassador Fiona Bruce, taking the total amount to £5000. 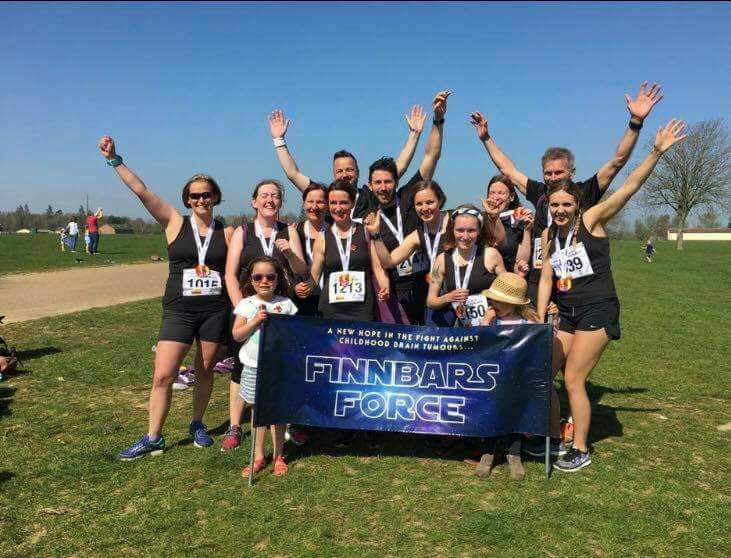 Finnbar’s Force are excited to have been chosen as the Nor-Con 2017 Charity! 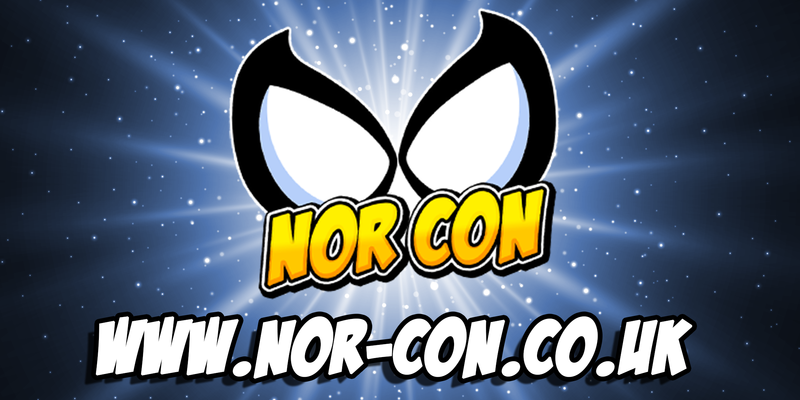 The Norfolk TV, Film & Comic Convention will be held at the Norfolk Showground Arena on 7th & 8th October. Celebrity guests this year include Chris Barrie (aka Rimmer from Red Dwarf), Paul Kaye (aka Thoros of Myr from Game of Thrones) Toyah Wilcox & many more. We will also be doing a short talk on stage. There are tons of exhibitions and loads of things to keep TV, film and comic fans entertained, especially those who love their Sci-Fi! 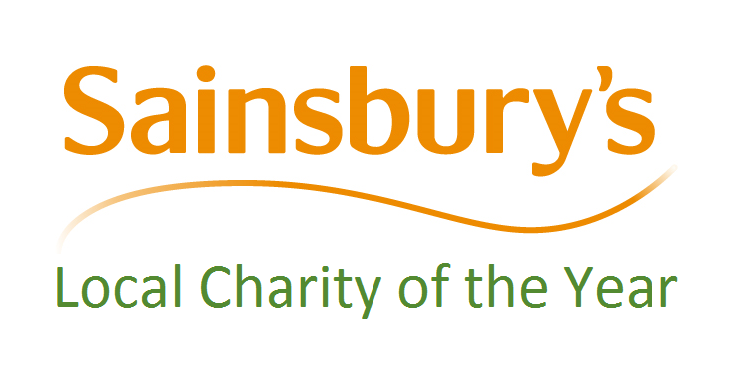 Have a look at their website here for more information! 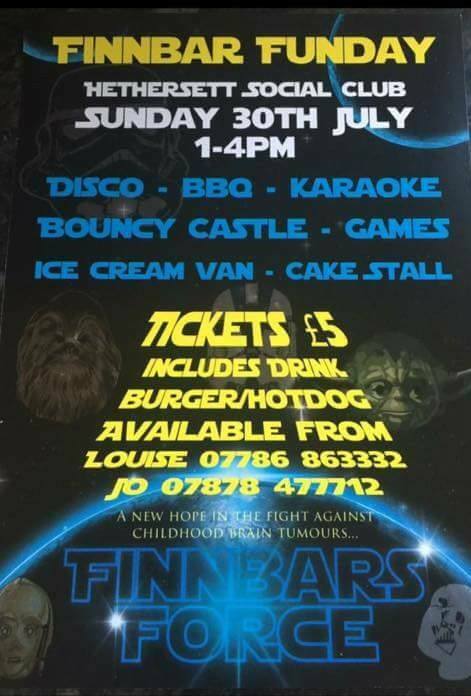 On Sunday 30th July Hethersett Social Club hosted a Funday for Finnbar’s Force, with plenty for the kids to do and BBQ & drink included in the entry fee! 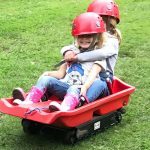 Over 80 children and their families attended and raised 0ver £1100 for the charity – well done to all involved! 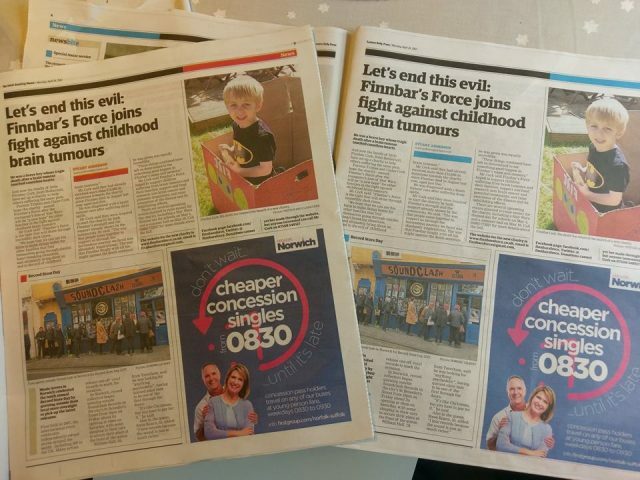 The event was also covered in the EDP. On Sunday 21st May over 400 people joined us on an adventure through the park, hunting for characters from the Star Wars films, before setting up a picnic camp for The Resistance! Children will took a stamp card to collect stamps from characters that they found around the park. 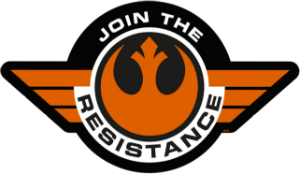 Once they returned to Resistance Base they exchanged their stamped card for a medal and joined in a celebratory picnic, proclaiming victory over the First Order – for now! 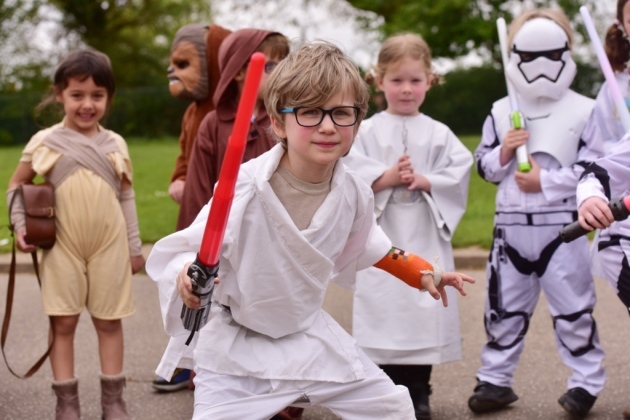 We’re supported by the fantastic guys from Norwich Star Wars Club who brought along more than 20 fully costumed characters from across the Star Wars films! 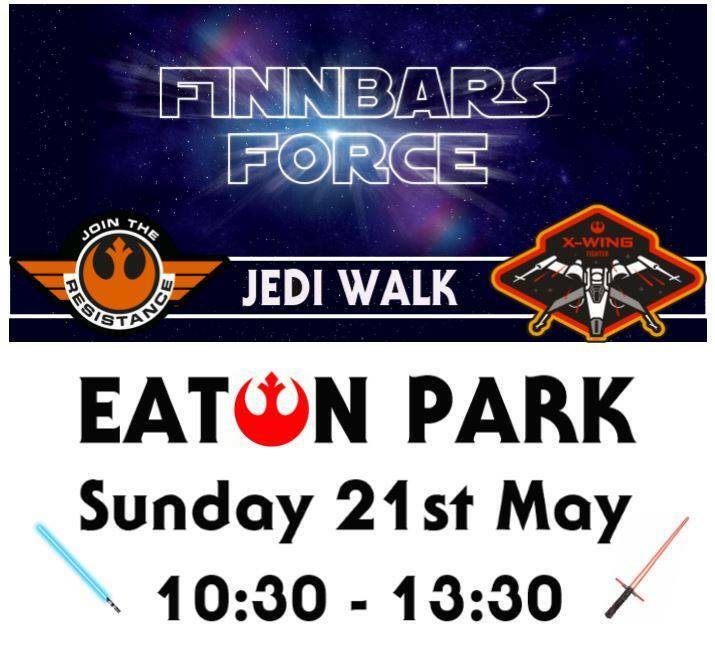 The event raised a fantastic £1270 for Finnbar’s Force! Thank you to all who came along to support us!  A MASSIVE THANK YOU to all the schools, children, teachers and parents that made the Finnbar’s Force ‘May The 4th Be With You’ Day such a wonderful day and a HUGE success! We saw some amazing costumes, some epic battles and a ton of fun! But most importantly so many more people will now be aware of our charity, our story and our mission! 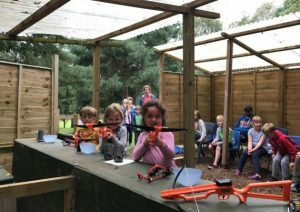 We had some great coverage in the media too! 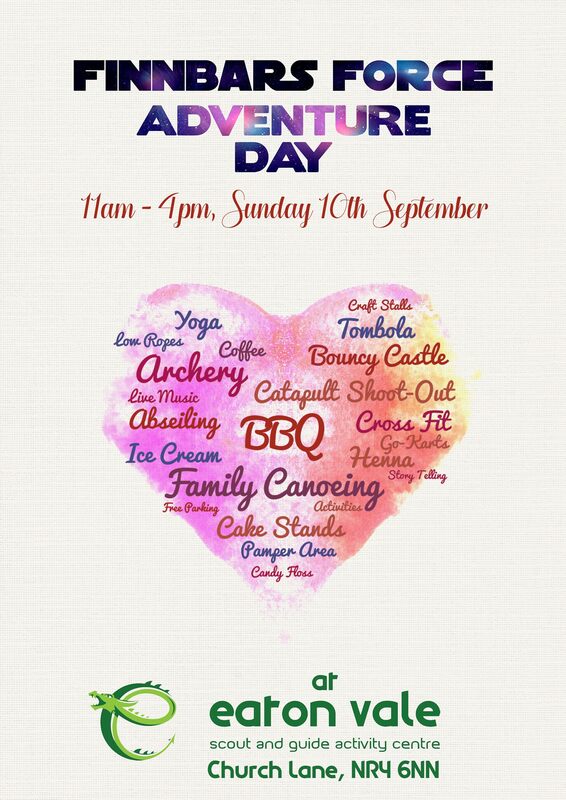 Thank you to Archant (EDP, Evening News, Mercury, Mustard TV), Heart FM, BBC Radio Norfolk and Anglia TV for sharing the day. There are some great photos in the article below. Dance like Ren McCormack, play Blackjack like Bond on our casino tables and keep your memories from our photo booth. An evening of your favourite films, with a 2 course dinner with sweet options, dance and more! Tickets £27 per person, covering entrance and a 2 course meal with a selection of sweets from our own Willy Wonka factory! 7pm til midnight at Glen Lodge at Bawburgh Golf Club.